With just a few clicks start selling your services online in no time! It’s never been this easy to sell online. Build your business by selling products online with Online Store. 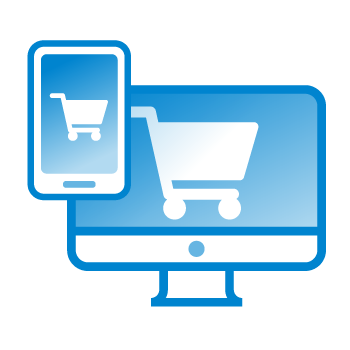 Integrated directly within the Online Presence Builder, our Online Store works seamlessly to enable you to merchandise and sell products, while accepting payments with ease! It requires no technical skills to start selling your products. The cart is easy-to-use and comes ready to support gift cards, discounts codes, recommended products and more. Online Store is directly integrated with Online Presence Builder. The easy-to-use dashboard will allow you to see a summary of store activity, sales and even a catalog of products. Sell directly through Facebook! Online Store allows you to integrate your website with your Facebook page and reach new customers easily. Online Store makes sure your customers feel comfortable submitting their personal information to you by ensuring your data is stored and transferred safely. Connecting to QuickBooks allows you to seamlessly transfer your sales information from your store to your PC or online version of QuickBooks with absolutely no work whatsoever.